It’s the dawn of a new day for the Gator running game. Specifically, a Scarlett dawn. We began our position by position breakdown of the Gators’ roster last week with an in depth look at their quarterback situation. Today, we’ll take a look at the running backs. Scarlett knows he did something he shouldn’t have done, regrets it, has truly repented for it and is now back with a vengeance. This dude has gained what looks like 100 pounds of pure muscle and has to be the objective favorite to get the start at running back not just because of his brute strength but because of the sheer grit and experience he brings. In case you’ve forgotten, Scarlett is also extremely shifty for a guy his size and is more than able to block and catch out of the backfield to boot. To put that all in one sentence: he’s a true all purpose back. Expect 1,000 yards or more out of him this year assuming he doesn’t get hurt. Perine is a similar style of runner to Scarlett, and thus can be used to batter opposing defenses when Scarlett needs a breather. He also figures to be the Gators’ go-to goal line and short yardage back. A tough, physical runner who has improved as a blocker over the course of his two year career, Perine would start for about three quarters of the teams across the country. Look for him to spell Scarlett at times and provide the Gators with a secondary runner who all but mirrors the skill set of the guy ahead of him- a relative rarity in college football. Why is Davis listed as the dark horse, and third on my preseason depth chart predictions when he has the highest upside on a unit filled with high upsides? Because of a knee injury. Specifically, the one that he suffered last year against Georgia. Simply put, that’s not something that’s easy to come back to full strength from, and though today’s medicine has certainly helped, it still takes time. With that major caveat in place, though: if he does come back to full strength, watch out. He’s an explosive back that could more than complement the battering ram tandem of Scarlett and Perine. His only real mistake of 2017 was fumbling at the one half yard line of what could have been a backbreaking touchdown run against Tennessee. He pairs incredible vision to see the hole with quick acceleration to get to and through it before it closes, not to mention pure speed, and that’s an absolutely deadly arsenal of tools. We’re talking Doak Walker potential here… if he’s able to get enough carries. Lemons didn’t do much as a freshman other than return a few kicks, but he, like everyone else, has taken advantage of Nick Savage’s offseason regimen and bulked up to the point of being a freak of nature. His biggest problem is that, while a monster, he sits fourth in line in the pecking order for carries as summer practice begins and thus has a long way to go. 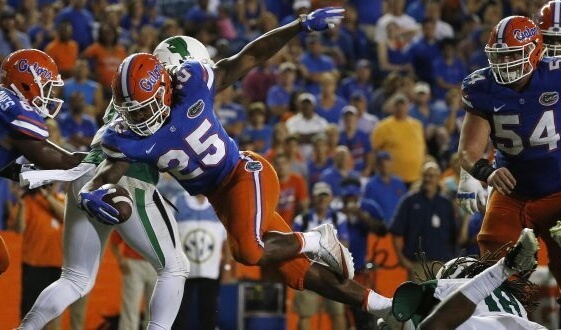 But should the injury bug start biting the Gators’ running back corps, Lemons could step into a major role seamlessly. I would not objectively trade Florida’s running back corps for that of any other team in the country. This unit has a trio of angry bulls (Scarlett, Perine, Lemons) and possibly one of the shiftiest backs in the country (Davis). The Gators could easily finish in the top 25 nationally in rushing yards per game if these guys- and the offensive linemen who block for them- stay healthy.